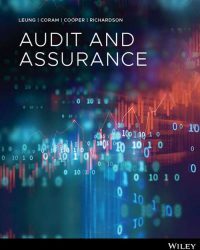 Written for the local market, the first edition of Audit and Assurance, 1st Edition (Leung et al.) features a concise and contemporary presentation of auditing. The text is delivered in a cutting-edge interactive digital format, and contains case studies such as Ernst & Young’s acclaimed audit case study, Cloud 9. The aim of this case study is to expose students to the practice of auditing and the tasks they would typically perform in their first year of auditing practice. This new edition includes enhanced content such as practitioner videos that help connect the theoretical with the practical (real world examples), animations and interactivities that are embedded at the point of learning to bring course concepts to life, Concept Check questions that allow you to test your comprehension and gain instant feedback of where your strengths and weaknesses life, as well as the opportunity to work between the online and offline to cater to how you study best. Practitioner videos that provide insights into the application of audit and assurance concepts. Interactive questions that provide you with the scaffolding to attempt and solve problems. Revision sets (Concept Check questions) at the end of each chapter to help you understand your strengths and weaknesses by providing immediate feedback.